US embassy in Moscow.With 'spy box' on its roof. While much of the world’s attention has been focused on NSA and US spying through the internet and electronic devices, one area that has been overlooked are advances in/and activities surrounding signals intelligence through the radio spectrum. An area which has also made huge advancements over the last 20 years. One of the key points for collecting foreign intelligence for almost any country are the embassies and diplomatic missions of the word’s states abroad and with the revelations by Edward Snowden of NSA servers based in US Embassies worldwide, this has once again placed a focus on the sovereign territories of countries as embodied by their diplomatic missions. 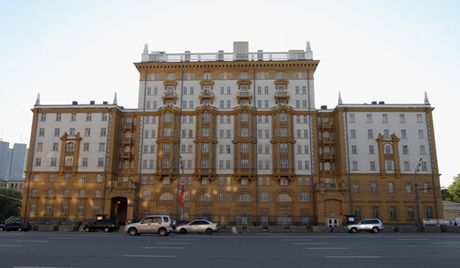 If one drives by the US Embassy in Moscow and looks up one might notice a white shed-sized "box" situated prominently almost directly in the middle of the embassy’s roof. But what is it? Well the answer is most likely a camouflaged spy post. I contacted a source with expertise in Signals Intelligence (SIGINT) about the "boxes", which appear on US and UKUSA member embassies worldwide and he/she said the white "sheds" are actually called "Secure Compartmented Intelligence Facilities" (SCIF). The source said that there are two types of installation, some are temporary and portable and some are permanent. The temporary or portable structures are covered with a white material which is apparently a "modified Kevlar made material that allows RF through with minimal attenuation." The permanent locations such as on the US Embassy in Moscow and the US Embassy in Berlin have "dielectric windows (a dielectric window is not made of glass but it is transparent to radio waves ) which hide the specialist antennae and amplifiers, codenamed EINSTEIN and CASTANET respectively". The source said that the specific frequency capability is dictated by the target frequencies and the structures allow for multiple intercepts including: data, voice, and whatever else they can receive. The innocent looking "boxes" are not only based all over the world on the roof tops of embassies worldwide but they are all part of a global spy network with the codename "STATEROOM". It is part of a "Special Collection Service" or (SCS) apparently placed with the knowledge and participation of the FiveEyes (FVEY) (UKUSA) participants or USUKCANAUSNZ. As I have written before UKUSA is a SIGINT alliance of the same "Five Eyes" countries, United States, United Kingdom, Canada, Australia and New Zealand. The source says that there is no evidence of such SCIFs being mounted in FVEY countries and that he/she suspects that this is due to hard connections available to the four others who then share their take with the hosting nation; meaning that no nation spies on its own, hence you have the UK’s GCHQ passing information on UK citizens to the NSA, and Australia’s DSD, Canada’s CSEC and New Zealand’s CSO doing the same, with the NSA apparently providing the other four with the same level of data on their own citizens. The relationships allow for the FVEY countries to spy on their own citizens by having a "foreign" partner do it for them, thus skirting all of their own national laws and constitutions. The source was asked about a cylindrical shaped structure on top of the UK Embassy in Berlin and stated that he/she thought it was not part of STATEROOM . The source speculated that it could possibly be a probe into the beamwidth of a telephone microwave link. Although the obvious targets of such surveillance are Chancellor Merkel and her Government Offices (German High Command) the source says, the dielectric window on the UK Embassy in Berlin is 90 degrees and one pane is pointing over the top of the British Embassy towards the Russian Embassy on the Brandenburg Gate a minutes’ walk away. On the 11th September a man by the name of Ali Mansouri, an alleged member of the Iranian Quds Force, was arrested for espionage operations in Israel. In his possession were photographs of various sites including the US Embassy in Tel Aviv which actually showed the SCIF atop the building. The media release on his arrest was not until the 29th of September so possibly, according to the source: "… intelligence agencies such as the German BND were taking a look atop the US Embassy in the Pariser Platz." So that takes care of the white "boxes" and other structures and designs on the roofs of FVEY Embassies, now what about the NSA servers in the basements? Kind of hard to photograph those I guess.